Is it a phone? Is it a camera? Do you care? Zoom! ZOOM! ZOOM! It's still a phone though. We really want to like the Samsung Galaxy S4 Zoom. If the camera or phone part was better or the price tag was lower then it would make sense, but it's a poor compact and a mid-range phone with a high end price tag. The Samsung Galaxy S4 Zoom is an unusual beast. In some ways it seems like a great idea, smartphone cameras have always paled in comparison to their compact counterparts, so why not stick a compact quality snapper on a phone, rather than forcing photo fans to lug both around? Of course on the other hand sticking a massive lens on the back of a smartphone isn't the most ergonomic of design decisions. Samsung has also muddied the waters a little as the S4 Zoom has very little in common with the Galaxy S4 and rather more in common with the Samsung Galaxy S4 Mini, albeit it with a camera stuck to the back. Likewise that camera isn't a high end compact - it certainly can't compete with something like the Fuji X20 for example - but because the Samsung Galaxy S4 Zoom is both a phone and a camera it commands a premium price tag of roughly £440 (around $660, AU$720) SIM free, despite not being a premium example of either. That said it's far from bad. Its 1.5GHz dual-core processor ensures that it's reasonably snappy, though some way short of the 1.9GHz quad-core Galaxy S4 and a little worse off than the 1.7GHz dual-core Galaxy S4 Mini. The Samsung Galaxy S4 Zoom also has 1.5GB of RAM- which is a match for the S4 Mini. There's a disappointingly small 8GB of built in storage, but there's also a micro SD card slot, so you can boost that by up to 64GB more if you invest in a card. At first sight the Samsung Galaxy S4 Zoom is a rather off-putting device as it looks more camera than phone. It's hard to imagine using it to text or browse the net, let alone putting it up to your ear to use for calls. But in reality it's not actually too bad. Yes you might get a few stares when you start talking into what looks for all the world like a camera, but it's not uncomfortable to hold either in landscape or portrait as your fingers can comfortably wrap around the camera lens and the protruding edge at the other side, so it's no more awkward to use than any other phone. Carrying it around in your pocket is slightly more of a problem, as thanks to the camera lens on the back it's pretty bulky, coming in at 125.5 x 63.5 x 15.4mm. The length and width aren't much greater than the similarly specced Samsung Galaxy S4 Mini, but the Mini is only 8.9mm thick. If you've got big pockets it's not a problem, but skinny jeans might be a no-go. Similarly the Samsung Galaxy S4 Zoom is quite weighty at 208g (around 7oz). That's nearly double the weight of the Galaxy S4 Mini and quite a bit more than even the monstrous Samsung Galaxy Note 2 - which comes in at 183g. It's a noticeable weight too and not totally balanced as the side of the phone with the camera lens is disproportionately heavy, though not by much as the other side holds the battery. It's not uncomfortable and nor is it heavy enough to weigh you down, but it is more than we've come to expect smartphones to weigh. Aside from the fact that the Galaxy S4 Zoom doesn't look much like a phone it's a reasonably good looking device. The back of the phone is mostly glossy white plastic, with a large metallic 16 megapixel camera lens at one side featuring 10x optical zoom and optical image stabilisation. It can also shoot 1080p video at 30fps. There's a protruding edge at the other side adorned with Samsung's logo and jutting out as it does gives you something to grip, making it easy to get a firm hold of the handset. Between the lens and the edge there's the Xenon flash, while at the far side of the lens there's a speaker. One issue with having the raised lens and grip on the back is that the Samsung Galaxy S4 Zoom is slightly unstable when screen up on a surface. It's not going to go anywhere but it does sit at an angle and will rock up and down if you try and use it. On the plus side that sloped angle does give you a better view of the screen than if it were totally horizontal. 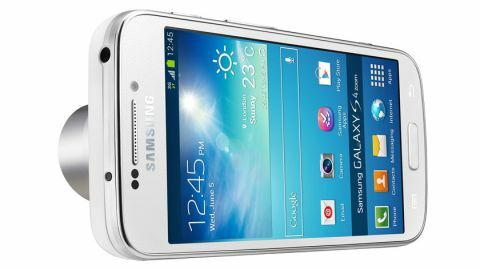 The front of the phone looks an awful lot like the front of the Samsung Galaxy S4 Mini. It has a 4.3 inch 540 x 960 Super AMOLED display with a pixel density of 256 pixels per inch, which is identical to the display on the S4 Mini. Unfortunately it's also not all that impressive, coming in at a sub full-HD resolution. The screen is encircled by a white border. Above the screen there's a Samsung logo, while above that you'll find the earpiece alongside a proximity and light sensor and the 1.9MP front facing camera. Below the screen there's a home button as well as a soft touch, light up button at either side of it- menu to the left and back to the right, but these can only be seen or used when the screen is on. The top of the handset (when held in portrait) has a 3.5mm headphone port at the right, a tiny microphone near the middle and an infrared port to the left. There's also a metallic rim that runs around the edge of the handset, making each edge half metallic and half glossy white plastic. It's a nice contrast and gives the Samsung Galaxy S4 Zoom a premium look. The bottom edge has a micro USB port in the centre - used for charging the phone or connecting it to a computer. It also has another little microphone to the right. You can also peel away a cover on the bottom edge to reveal the 2330mAh battery, which is removable, and the micro SIM card slot. It's a neat and discreet location for both of those things, as it negates the need to remove the whole back cover while still making the battery accessible. The cover is easy to open too, but feels securely locked in place when closed. The left edge of the Samsung Galaxy S4 Zoom features a little plastic cover at the bottom edge, which can be opened to reveal a microSD card slot with support for cards of up to 64GB. That's something which is much needed given the paltry 8GB of built in storage. The right edge of the handset features a dedicated camera button at the bottom. Having a dedicated camera button is no surprise given how much of a focus the camera is on this handset but it's still much appreciated given that most Android handsets don't have one. It's in the optimal position too, as it's where you'd expect to find one on a camera and doesn't get in the way of either the screen or the lens when in use. There's a volume rocker near the middle and a power button- which also sleeps and wakes the handset, near the top. These buttons are all done up in the same silvery metallic style as the rim that runs around the phone, leaving them looking high quality. All in all it's a well built, solid handset that isn't as awkward or uncomfortable to use as we'd expected. We'd go so far as to say that it actually looks pretty good - though we'd still take a conventional smartphone design over it from an aesthetic perspective. By smartphone standards the camera is in a whole other league, but it still can't match up to most decent compacts and the other specs aren't much to write home about either, leaving the Samsung Galaxy S4 Zoom slightly compromised for a device with a £440 (around $660, AU$720) price tag.